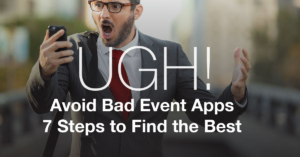 Event apps are not equal and most are designed for small meetings. Large medical meetings with complex programs, abstracts, posters, CME, sub-sessions, presentations, symposia, partner organization meetings, etc. need more than an average event app. Especially when considering the scale of some medical meetings or scientific conferences. We are not talking about 100 sessions over 3 days but 15,000 poster presentations over a single week. The author/speaker list contains over 50,000 entries in this case. Only event apps like EventPilot, specialized for large medical meetings, bring you the quality and functionality you need. In this article, published in the MeetingsNet Newsletter on Feb 16, 2018, you will learn 7 steps to finding the right app for large medical meetings.